I've always worn red or black with black and white polka dots and wanted to try a new color. I guess any color goes with black and white polka dots. This is a modified version of our choir uniform. I was supposed to wear the hot pink with black but opted for the polka dots because I wasn't going to be on stage. 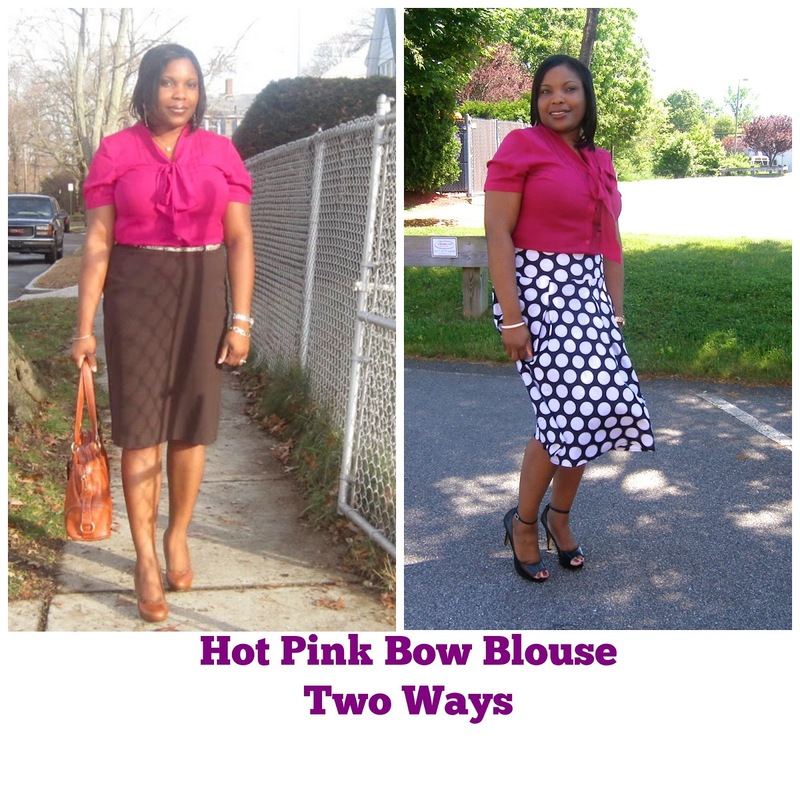 I'm remixing the blouse today, as shown below, and the skirt remix was featured in a previous post as shown here. What's your favorite color to wear with black and white polka dots? Love the colors Kemi! This is a great look! I really like the pink and polka dot combination. This is a pretty combination, Kemi! Love the skirt. Thanks for sharing with Visible Monday. I love navy and pink together - very sophisticated look! :) I definitely pair those two colors together often - you can't go wrong! If you're interested, I think this outfit would be a great contribution to the weekly Fashionably Employed Link Up that I host each Monday in which I highlight sophisticated style that would be office appropriate (and this is certainly a great choice for a summer day at work). Thanks for sharing! ... And your skirt is black. :) Sometimes I can't tell right away on the computer. Lookin' great though! Very pretty!! I love the polka dots on your skirt, a bit of a vintage vibe. The pink top is very pretty and I just love the color with it. Of course I love the shoes. So pretty and feminine! Love the hot pink with the black and white and the shoes are so perfect! Love the skirt, nice look. This is a beautiful look - I am really loving that gorgeous skirt! Usually red and pink are my go to colors for black and white polka dot, but this weekend I tried Kelly green and it looked great, too. I want to try a nice yellow soon. Stopping by from the link-up! Love your entire outfit but that skirt in particular!! I'm always down for a fun color or print with polka dots! You look great! I can't remember what my favorite color to wear with polka dots was, but hot pink is definitely my favorite now! Excellent outfit. Any color will go with that fabulous skirt. Love the cut, especially. So flattering for just about everyone. And of course, such cute shoes! Thanks Jan. I'm glad you are now able to consider hot pink as an option to wear with Polka dots. So cute, I love these polka dots on you!!! I have been looking for a polka dot skirt everywhere! Thanks for linking up with What She Wears!